Just three weeks ago, Emmanuel announced that we had purchased past due medical debts throughout Central and Southern Illinois in order to forgive them. We worked, as you will have heard, with a charity called RIP Medical Debt to do this. It was founded by two former collection agency executives who had a change of heart, and decided to use their skills to abolish people’s financial burdens rather than add to them. RIP buys “portfolios” of medical debt from health care providers and from the secondary debt market, which allows them to write off thousands of people’s debts at once for pennies on the dollar. With medical debt being one of the main causes of bankruptcies in America, we wanted to make in impact in this area. So in January our vestry decided to use part of the surplus from our Centennial wishlist campaign to work with RIP on forgiving medical debts locally, just to show a whole bunch of strangers unconditional forgiveness of the kind God has given us. Now, we had no idea how much we could do. RIP said, how about a countywide initiative? So we asked them to look at Champaign County for us. We thought the $15000 we had to work with might actually be enough to wipe out all the available past due medical bills here in our own county. What makes this night different from all the rest? Those of you who have attended Passover celebrations recognize this question which is traditionally asked by the youngest person in attendance. What makes this night different from all the rest? The Triduum offers many answers to this question. Each night our liturgy contains some parts that are familiar and ordinary but many more that are unique to that once-a-year service. If this is your first Maundy Thursday I encourage you to let the entire experience wash over you. In other words don’t try to figure it all out at once—it will overwhelm you. Actually, if this is your tenth or twentieth time that may still be good advice. Part of the beauty of liturgy and of scripture is that once in a while, occasionally, there may be something this particular time that you don’t remember having heard before. Even for the seasoned veteran of multiple Triduums there might be something that catches your attention, gives you food for thought, which leads to a new understanding. There’s no experience more central to the Christian year than the one we begin today. The events we make present and live through together this week are the heart of the Christian way of seeing the world and of living in the world. Holy Week is the center of spiritual time, and it is the center of the story by which disciples of Jesus understand the world and our own lives. We just read the entire passion story from the Gospel of Luke, the Gospel that Episcopalians are reading together Sunday by Sunday all year. On Good Friday, we will read the entire passion story from the Gospel of John. These events are so important that we tell them and tell them over and over. Jesus’ death on the Cross and his resurrection on the third day is mentioned in nearly every chapter of Paul’s letters. We never celebrate Eucharist without recounting that same story over the bread and the wine. It is on page after page of the Bible and page after page of the Prayer Book. Why? Why do we Christians center ourselves on the Cross like this? Well, we might want to ask first, where else could our center be? I can think of two candidates, actually, that are proposed all the time. I’m sure you’ve heard people suggest that religion really boils down to principles, general ideas like “peace on earth” or “you should value diversity” or “there is always hope” or “God is everywhere.” All of those are good enough principles, and in fact, I agree with them. But they are not where Christianity grounds itself. They come later. And I’m sure you’ve heard people suggest that religion really boils down to efforts to improve human behavior, either our own or somebody else’s. That our mission is to inspire people to be nicer, to be more accepting or more mindful, to fight racism and sexism, to help the poor. All of those are good things to do, and I support them, too. But they are not where Christianity grounds itself either. They too come later. Christianity can’t be reduced to a set of principles or to a self-improvement or world-improvement program. As long as you try to approach it that way, you will never understand it. Christianity is grounded in the announcement of what God has accomplished in Christ on the Cross and in the empty tomb. It makes the claim not just that the events we live through again this week constitute the center of all history, but that in them God has offered liberation, forgiveness, and fullness of life absolutely free to anyone who is humble and honest enough to accept them. At Baptism we always ask the candidates questions about turning to Christ, and one of them is “do you put your whole trust in his grace and love?” Much of the time, let’s be 100% honest, many of us would have to answer that question, “Well, sort of.” We put some of our trust in his grace, and other parts of it in what we can do, or the principles and values we stand by, or the family or economic class or ethnic group we come from. We put some of our trust in his love, and others in the kinds of love and esteem that get given to us via our skills, our in-group, or our behavior. But that’s not what God calls us to. God calls us to a life where we do not look elsewhere to justify our existence, but where we put our whole trust in the grace and love that are given freely through the work of Christ on the Cross. So one of the reasons we tell this story over and over is that it’s so very hard for human beings to do that. We fail, over and over, at surrendering everything to God. Or we do it, but immediately grab some parts of life back to manage ourselves. So we need to hear it over and over again: the work of Christ in his Cross and Resurrection has already accomplished all that needs to be accomplished for us to be liberated, forgiven people, going about life with a kind of fullness that’s not available anywhere else. And the work of Christ in the Cross and Resurrection hasn’t accomplished that just for you, or for me, or for churchgoers. It’s accomplished that for all creation. Do you put your whole trust there? Even if you fail regularly at putting your whole trust there, because we all do, is that where you intend to put your whole trust? Is that where your trust returns, when you come to your senses and realize you’ve started looking to something other than Jesus to make you enough? Do you put your whole trust in his grace and love, or are you hedging your bets? Principles are fine. Improving human behavior is fine. But the events of this week, the experiences we will re-invoke and walk through together, through the amazing power of the liturgy, have changed human history. They’re going to change the whole cosmos. And if you step in and put all your weight onto them, your whole trust, they will change your life. Thanks be to God for his glorious Gospel. Here we are on the last bit of Lent—how did it get to be Lent V already? Palm Sunday is next week. In fact our palms arrived this past Friday! From this perspective it seems like the season has gone by quickly though maybe that is because collectively we have done much to bring God’s love to the front of our minds. I hope it has been a productive Lent for you and if you don’t think so just yet, we do have one more week. One of the community actions we have taken through the season has been to read passages from the Gospel of John each day. Following the pattern of the daily lectionary we are currently beginning the ninth chapter of John. Though we won’t finish the gospel before Easter it is a discipline that we can continue. When we began this Lenten journey Mother Beth talked about this particular gospel in comparison to the other three. From these comparisons I was reminded of something I learned a long time ago in counseling classes. That is, there is a difference in relating what has happened and how those actions affect us. The goal of a good counselor is to go deeper than the action. John’s gospel does this; it goes deeper. The synoptic gospels, Matthew, Mark, and Luke are often like news reports, relating the facts of what occurred. Mark in particular loved to tell one thing after another. “This happened and then immediately this next thing happened.” Of course each of these gospel writers has a slant on Jesus’ story by when they wrote and the audience for whom they wrote. We get a lot of our familiar Bible stories from these three gospels. John, though, is different. From its beginning John is trying to connect the news of Jesus life to its meaning. John writes in a more personal way and asks a more personal response. Using my analogy you might say that John is the op-ed writer while the other three give a more front page straight forward story. This parable of Jesus that we have just heard is one of the most familiar and beloved passages in all of scripture. It touches us on so many different levels, and is like a bottomless well from which we can draw an endless supply of living water to slake our spiritual thirst. Every time I come to it, I find something new. This time around, my attention was arrested by a detail that is casually passed over as Jesus tells the story in Luke’s gospel. The younger of two sons asks his father for a premature distribution of his share of the father’s estate; in other words, he wants his inheritance while Dad is still 98.6 and vertical, rather than room temperature and pushing up daisies. This is really an outlandish and incredibly selfish request. Not only is it offensive on a mere personal level—talk about breaking a parent’s heart—but it was also a considerable financial imposition. Imagine what it would take for you to come up with half of your net worth in cash. He probably had to sell some livestock and some precious metals and some real estate on terms that were not particularly advantageous. I bring this up because, later on, when the “prodigal son” returns home penniless and disgraced, we are in awe of the father’s love that welcomes him back without any recriminations or awkward questions. For the son, that homecoming was a wonderful experience of forgiveness and grace. But for the father, it came at a cost. It cost him on both ends of the transaction—first when he liquidated his assets in an untimely manner, and then again when he threw a welcome-home party for his younger son that jeopardized his relationship with his faithful older son. And, of course, since the obvious point of the parable is that we should transfer our regard for how the loving father treats his flaky son to how our loving God treats us flaky children, it’s also easy for us to overlook the cost factor. It’s easy for us to conclude that our salvation—our redemption, our reconciliation, both “vertically” with God and “horizontally” with our fellow human beings—it’s easy for us to conclude that our salvation doesn’t really cost God anything, that it’s just a matter of God shrugging his shoulders and saying, “Oh, well, people will be people. You gotta love ‘em, though, so I’ll just overlook their screw-ups and wink at their infidelities.” Dietrich Bonhoeffer, the German pastor and theologian who was martyred by the Nazi regime toward the end of World War II, coined the phrase “cheap grace.” Cheap grace doesn’t exist in reality, but it’s often alive and well in our imaginations. We see passages of scripture like “Return to the Lord, for he is gracious and merciful; slow to anger and abounding in steadfast love,” and the image that pops into our mind is not so much God the Father as God the Grandfather, who thinks we’re cute even when we’re naughty, and who pats us on the head and tells us to try a little harder to be nice as he slips us a piece of candy on the sly. We continue to have a healthy appetite for “cheap grace,” I think, because we have a generally distorted conception of love. We confuse who we are with what we do, so we think that if someone loves us, they are obligated to approve of everything about us, to overlook our faults, and never confront or challenge our opinions or our behavior. No embarrassing questions about just how we managed to squander our inheritance in, as the King James Version puts it, “riotous living.” No parental advice on how to avoid repeating the disaster that we have brought on ourselves. No judgment, no consequences; just support, encouragement, and acceptance. That’s what love is, right? Our taste for cheap grace is also nourished by a distorted notion of forgiveness. “It’s OK, think nothing of it.” “Not a problem—no big deal.” …as if the most serious thing we ever have to forgive is somebody accidentally stepping on our toe. Reinhold Niebuhr, an eminent Protestant theologian from the last century, described the theology of cheap grace as presenting us with "a God without wrath [who] brought [people] without sin into a kingdom without judgment through the ministrations of a Christ without a Cross.” No wonder the cross has turned into a talisman, a fashion accessory. You’ve probably heard the story about the shopper who inquired at a department store jewelry counter, “Do you have any crosses?” The sales clerk responded with enthusiasm, “Oh, yes, we have several. Some are earrings, some are pins, and some come on necklaces. Most of them are plain, but some of them have a little man on them.” A little man. Indeed. Let’s take an honest look at the sacred scriptures, particularly those appointed for this Fourth Sunday in Lent. What do we see? We see the second of St Paul’s two letters to the Christian community in the Greek city of Corinth. Paul reminds the Corinthians, and reminds us, that “for our sake [God] made him to be sin who knew no sin…”. Now this is certainly a strange phrase. It refers, of course, to Jesus, who “knew no sin”—in other words, he was himself sinless; his being and his doing were at all times completely oriented toward the will of his Father. God took his own sinless son and “made him to be sin.” What does this mean? It means that Jesus was a sort of black hole for all of human sin, indeed for universal evil itself. Jesus absorbed into himself every act of genocide and mass murder, every act of tyranny and torture, every hate crime, every act of enslavement and human trafficking, every act of sexual predation, the sum total of social injustice and exploitation of the poor and marginalized, every misuse of our God-given desires and appetites, every act of infidelity and betrayal, every evasion of lawful and just taxation, every white lie, every disregarded traffic signal and every plagiarized term paper. Jesus took all of this into himself, and carried it to the cross. For our sake, God made him to be sin who knew no sin. This quality of proactive generosity in God’s love is evident in the Prodigal Son parable: Notice how, when the son returns home to see if his father will take him on as a hired hand, he doesn’t have to pound on the door and beg the butler to fetch his father. No, the father sees him from a distance, and runs out to meet him with open arms. The father hasn’t forgotten; he’s been watching and waiting the whole time. My brothers and sisters, God’s grace and forgiveness doesn’t cost us a dime, but it is far from free. Jesus has paid the price, God has paid the price, for our salvation, for our redemption, for our reconciliation. We’re all familiar with the gospel accounts of Jesus’ suffering and death. The details are etched into our imaginations. We are—most of us— acutely aware of the details of the agony that Jesus endured on our behalf. The verbal humiliation, the brutal scourging, the cynical crowning with thorns, all before carrying a heavy cross several hundred yards and up a hill while a crowd continues to taunt him, and then being nailed to the cross and lifted up to die. And die he did. There’s nothing cheap about grace. It is enormously costly. We’re way too impoverished to pay the price, so Jesus pays it for us. To those of us who have experienced the costly grace of God, the cross can never be a mere talisman or fashion accessory. It is a symbol that we venerate and embrace and love, because it stands before us as the sign of the length to which God was willing to go…to save me, to save you, to save anyone who comes to him in faith. The astounding truth of God’s love is that, if you were the only person in the entire world, Jesus would still have died for you. The one who knew no sin became sin for our sake, “…so that in him we might become,” not sin, but “the righteousness of God.” We should glory in the cross of our Lord Jesus Christ, in whom is our salvation, our life, and resurrection. Amen. We just forgave $4 Million in Medical Debt! If you missed services on March 31, here is a writeup with more information about Emmanuel's outreach initiative that was announced that day. Bishop Martins' sermon appears in a separate post. Emmanuel Memorial Episcopal Church in Champaign has purchased $4 million in past due local medical debt with one purpose: to forgive it. This week, 3617 financially strapped households in counties throughout Central and Southern Illinois received letters informing them that their medical debts have been paid off by the church. The Rev. Beth Maynard, Emmanuel’s Rector, announced the debt forgiveness initiative at Sunday services on March 31, when the Rt. Rev. Daniel Martins, Bishop of the Episcopal Diocese of Springfield, which covers the area affected, was visiting the church for Confirmation. To find local households who were struggling with unpayable bills, Emmanuel worked with RIP Medical Debt, a New York-based charity founded by two former collection agency executives. Using a list of Episcopal Diocese of Springfield counties provided by the church, the charity searched bundled debt portfolios to locate Central and Southern Illinois accounts held by households in financial difficulty, and then negotiated bulk purchases at pennies on the dollar. Emmanuel’s donation of $15,000 offset debt of $4 million – over a 26000% return on investment. "I applaud Emmanuel Memorial Episcopal Church for their dedication in realizing this important campaign," said RIP co-founder, Jerry Ashton. "We feel incredibly privileged to work with any faith-based organization committed to relieving the burden of un-payable medical debt in its community." Emmanuel also made donations benefiting two Champaign nonprofits as part of their centennial campaign: empty tomb, which deploys church volunteers to assist local families with a diverse range of needs, and the grassroots homelessness ministry C-U at Home. 43 million Americans now owe about $75 billion in past-due medical debt, and medical debt is a major contributor to bankruptcies. 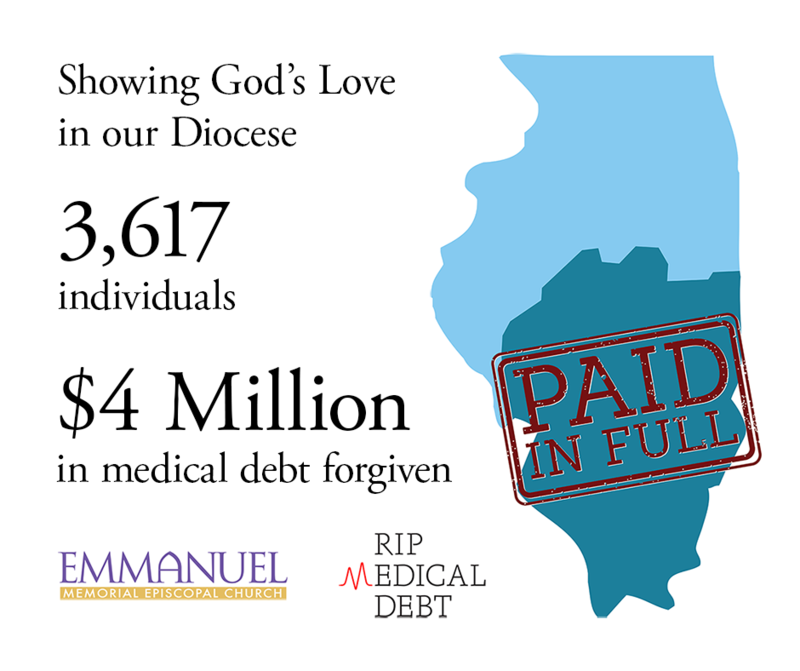 After learning about the issue, Emmanuel’s Mission Leadership Team voted in January to approach RIP Medical Debt about helping the church intervene in this crisis on behalf of households in the Episcopal Diocese of Springfield. The organization accepts larger gifts like Emmanuel’s, but individuals can make donations as well. RIP Medical Debt is a nonprofit organization that allows generous donors and organizations to erase the debt of Americans whose lives have been ruined by destructive medical debt. Founded in 2014 by two former collections industry executives, Craig Antico & Jerry Ashton, RIP rose to national prominence on an episode of Last Week Tonight with John Oliver that has been viewed almost 10 million times, where RIP facilitated the erasure of $15 million in medical debt that only cost $60,000. To learn more and get involved, visit www.ripmedicaldebt.org. Emmanuel Memorial Episcopal Church, located in downtown Champaign IL, is a congregation whose mission is to know Jesus Christ and to make him known. One of 33 congregations in the Episcopal Diocese of Springfield, Emmanuel offers ancient roots, warm community, and meaningful service. Among the church’s approximately 200 households are life-long Episcopalians, people who grew up in different faith traditions, and those who had no prior religious background. To learn more and get involved, visit www.emmanuelmemorialepiscopal.org. This week all over the Episcopal Church many of us clergy said to ourselves, “Sunday would be a great day to skip the Gospel lesson and preach on the Old Testament.” This Gospel text today is pretty strong stuff, I must admit, but Lent is for strong stuff. When the Church gives us things like this to deal with, I am often reminded of a famous line from St. Augustine: “if you believe what you like in the Gospels and reject what you don’t like, it is not the Gospels you believe but yourself.” So what might it do for us if we tried out believing this Gospel today? At the beginning of this difficult text, some people – we don’t know who or how many – interrupt Jesus with a shocking story. It’s a shocking story that we who have followed recent news can relate to directly. The group comes to Jesus, who has just been teaching about the urgency of responding to God, and they tell him that in the Temple in Jerusalem, as worship was going on, someone came in and killed a group of Galileans in the middle of the sacrifices. Right there in a house of worship – a horrible thing to think of, and something we know all too well because we’ve seen it. Of course the mosques in New Zealand last week. Back in October, Tree of Life Synagogue in Pittsburgh. In 2015, Mother Emanuel church in Charleston South Carolina. Not to mention incidents that tend not to get reported here. There’ve been many attacks on Christians praying in Nigeria, for example, and many attacks on Muslims praying in Afghanistan. It's terrible. It's shocking. So: Have you heard, this group of questioners press Jesus. Have you heard about those Galileans whose blood Pilate mingled with their sacrifices, right there in the Temple. (I assume they mean that Pilate, the governor of Judea, had ordered this killing, not that he literally came and did it himself.) At any rate, this was not an isolated act by a rogue person or an extremist group. It was not someone motivated by an abhorrent ideology like anti-Semitism or like white supremacy; but it was a state-sponsored execution, designed as a public reminder of Roman power, much like Jesus’ state-sponsored execution on Good Friday will be. It being spring break, I would guess that some of our parishioners may be waiting in line at Walt Disney World right now. And if you’ve ever been there in high season, you know that if you didn’t plan well and use your Fastpass+, you can you find yourself in some interminable line, standing next to a sign that says, "Waiting time from this point: 30 minutes." Well, it's the 2nd Sunday in Lent ...waiting time from this point: 30 days. We are, after all, on our way somewhere. In the early years of the church, Lent served two purposes: first, it was the culmination of three years of formation for people who wanted to become Christians. Second, it was a time when people who had fallen away from Christ could go through a process to be restored to the community. Both those groups would have known they were on a journey, looking forward to the Great Vigil when they would at last be baptized, or when they could at last receive Communion again. Now that Lent has also become, as we heard on Ash Wednesday, a time for all of us to renew our repentance and faith, we can sometimes lose track of the group pilgrimage aspect. All over social media you see people saying things they’ve privately decided to do for Lent, things that often don’t really connect with what Lent is and from a Christian point of view are pretty much guaranteed not to work or even, frankly, to backfire. As Fr. Caleb warned us last Sunday, Lent isn’t a time to go on a diet or try to behave better. It’s about joining the whole Church’s journey to resurrection. A key way we do that is by deliberately encountering parts of us that are resisting resurrection, and submitting them to Christ. ​He ate nothing at all during those days, and when they were over, he was famished. Today, on this First Sunday of Lent, I want to consider the significance of Christ’s hunger in the wilderness as he resists the temptations of the devil. St. Luke informs us plainly that after eating nothing for forty days, Jesus was famished. You might wonder why being famished at the end of forty days without food would be worthy of note -- seems like pretty self-evident consequence -- but still, the text draws our attention to Jesus’ hunger nevertheless. It makes us consider the fact that he persisted alone in the desert for forty days with nothing but the Spirit who had filled him. This was all he had to arm himself with against the devil’s assaults. It is a point that we are not to miss. And seeing that we are now in the Season of Lent, a time of fasting and penitence, the hunger of Christ takes on immediate relevance to us. What does Christ’s hunger and temptations reveal about his preparation for his Passion ? And in turn, how might this reading frame the entirety of our Lenten practice for the coming weeks? A couple of weeks ago, the Washington Post columnist Michael Gerson was invited to deliver the Sunday sermon at the Washington National Cathedral. Not everyone knew before that morning that he was an Episcopalian, but in the pulpit he revealed something else that almost nobody had known. Only 2 weeks before his preaching date, he had been hospitalized for depression. Gerson told the congregation, and since his sermon has gone viral, has now told millions of others, that like an estimated 10 million Americans, he lives with chronic clinical depression. He described eloquently – he’s a writer, after all – how with depression your brain takes a chemical imbalance and winds a narrative around it, convincing you of things that simply aren’t true: that nobody cares about you, that you are accomplishing nothing, that it’s never going to get better. Gerson believed he was coping normally, but people who loved him knew different and helped him get into the hospital for treatment.